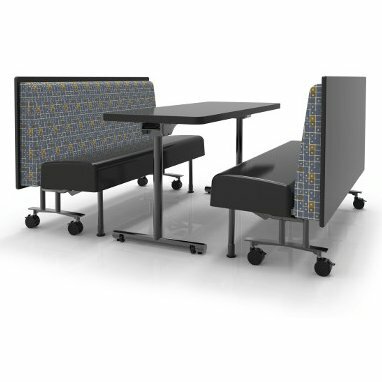 The need for dining spaces to serve multiple roles requires dining furniture to be more mobile, flexible, easy to reconfigure and store. Existing furnishings do not accommodate that very well, that is until today. Introducing a revolutionary mobile, fold-able booth system called CHARIOT. The mobile CHARIOT Go Bench features a seat that folds up and built-in casters allow the whole bench to be wheeled away for easy reconfiguration or storage. The CHARIOT Go Table features built-in casters that when stationary is rigid and does not move—the casters are activated by picking up the end of the table allowing it to be easily moved. 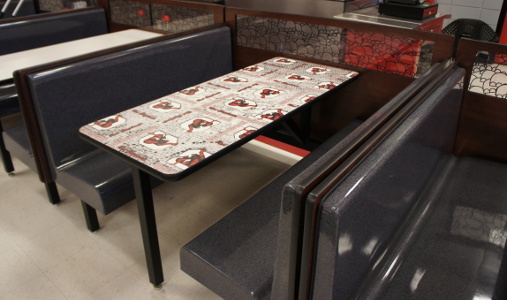 The CHARIOT tops feature an antimicrobial, antifungal and highly durable urethane “SMARTedge” that will not allow liquids to gather or seep into the seam between the laminate and the edge. Available in fixed, folding and flip-top versions.